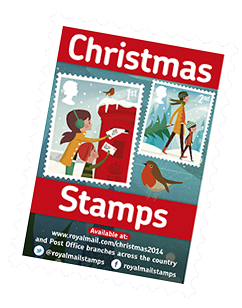 Aura Graphics helps Royal Mail roll-out its festive promotional vehicle campaign, advertising its specially designed Christmas stamps. Stamp collectors get excited, as for the first time the Royal Mail delivery vans have their own Christmas stamp. These special stamps are featuring on the company's vans throughout the festive period to promote the sale of its specially designed Christmas stamp sets and its all-important present delivery service. We produced these unique self-adhesive graphic stamps for 1,500 vehicles operating up and down the country on to easily an removable promotional film. Be sure to look out for one of these special vans in 26 towns and cities across the UK from Glasgow to Plymouth. We look forward to seeing this programme roll into next year when there are plans to feature the 2015 Special Stamp collections.